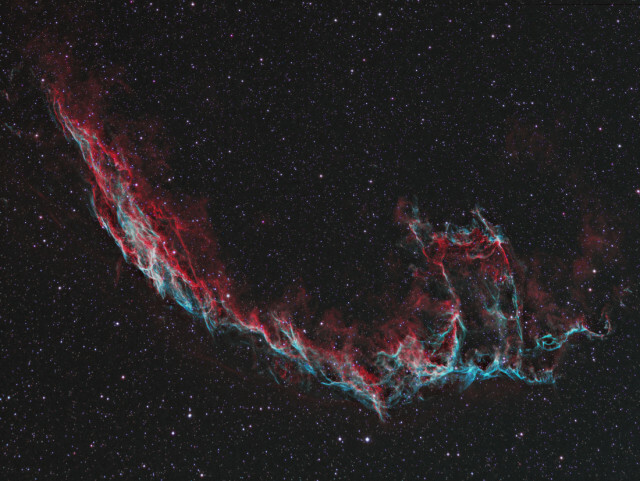 The Veil Nebula is a diffuse nebula located in the northern constellation Cygnus, the Swan. Also known as Witch’s Broom Nebula, Bridal Veil Nebula, Cirrus Nebula, or Filamentary Nebula, it constitutes the visible parts of the Cygnus Loop, a supernova remnant in Cygnus. 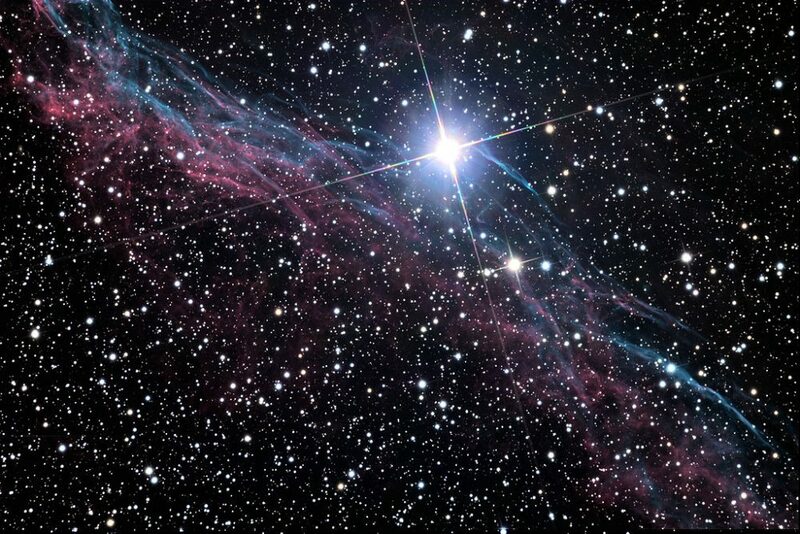 It is located at an approximate distance of 1,470 light years from Earth. 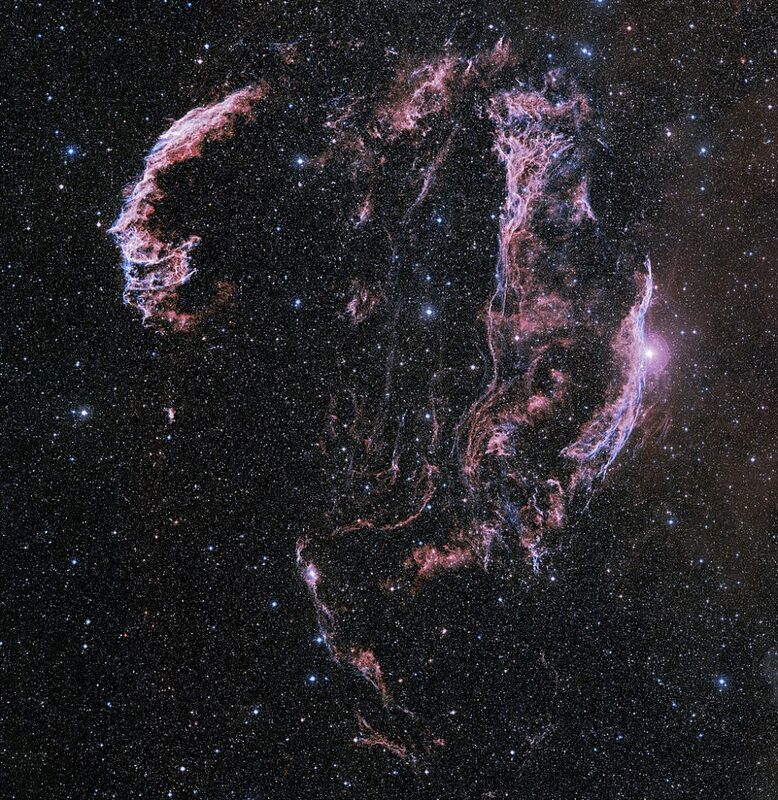 The Veil Nebula is a frequent object of study for astronomers because it is large, located relatively close to Earth, and makes a good example of a middle-aged supernova remnant. For amateur astronomers, the nebula makes one of the most spectacular objects in the northern sky. 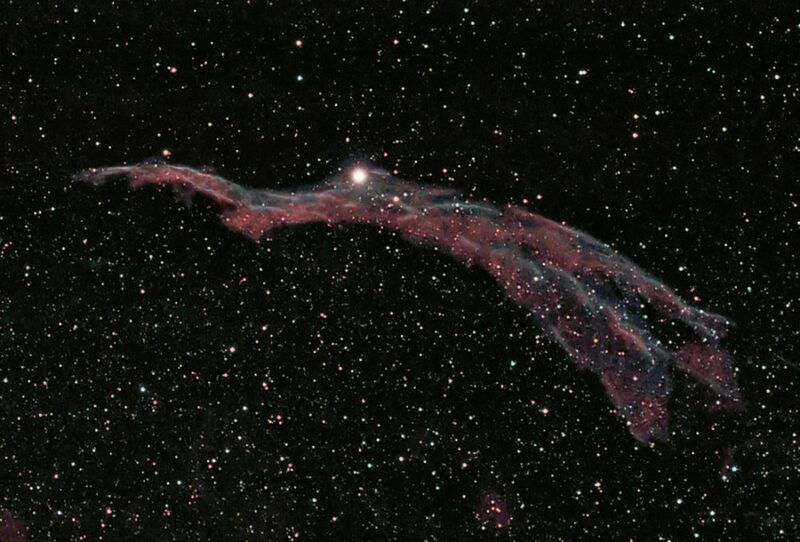 The Veil Nebula lies a few degrees to the south of the star Epsilon Cygni, also known as Gienah. Gienah is one of the stars of the Northern Cross and marks the right wing of the celestial Swan. Even though the Veil Nebula is relatively bright with an apparent magnitude of 7.0, it stretches over a large area and its surface brightness is pretty low, which makes it difficult to see without an OIII filter. The filter isolates the wavelength of light from doubly ionized oxygen, allowing astronomers to see the nebula using any telescope. The Veil Nebula is so large that, in addition to its brighter regions — NGC 6960, NGC 6992, NGC 6995, and NGC 6979 – the fainter extensions were also assigned catalogue designations. 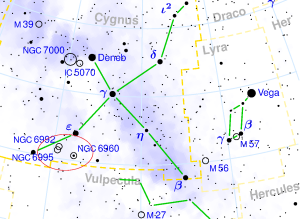 NGC 6974 is an extension of NGC 6979, the nebula’s northern part, while IC 1340 is an extension of NGC 6995. The wispy, intertwined structure of the nebula is a result of vast amounts of energy released as the debris from the supernova explosion moves at high speeds through the area, creating shock fronts. The debris moves at about 600,000 kilometres per hour and heats the surrounding gas to millions of degrees. As the material cools, it creates the coloured glows. The Veil Nebula is comprised of portions of the Cygnus Loop (SNR G074.0-08.6, Sharpless 103) that can be seen in visible light images. 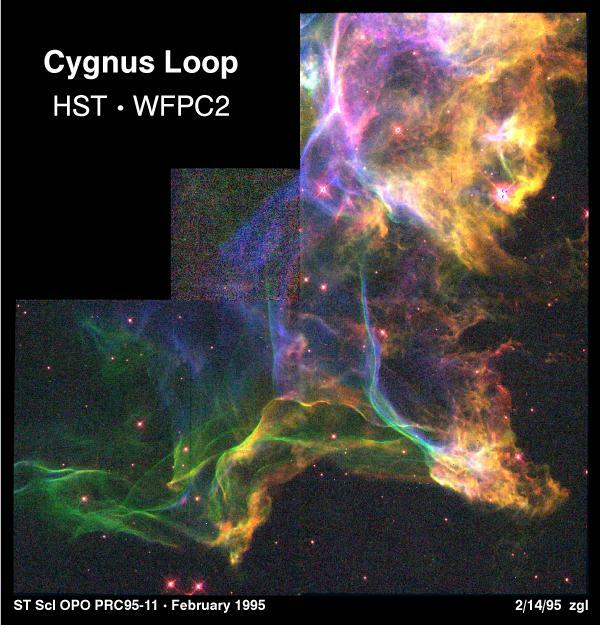 The other parts of the Cygnus Loop, which do not emit in visible light, can be seen in infrared, X-ray, and radio images. The Cygnus Loop is a large supernova remnant that originated in an explosion roughly 5,000 to 8,000 years ago, and has since expanded to cover a region about 3 degrees in diameter. This roughly equals six times the diameter of the full Moon. At the time of the explosion, the supernova was likely as bright as a crescent Moon. The remnant has faded since and can now only be seen in a telescope. The Cygnus Loop is a known source of soft X-rays. The X-ray source Cygnus X-5 coincides with the supernova remnant. 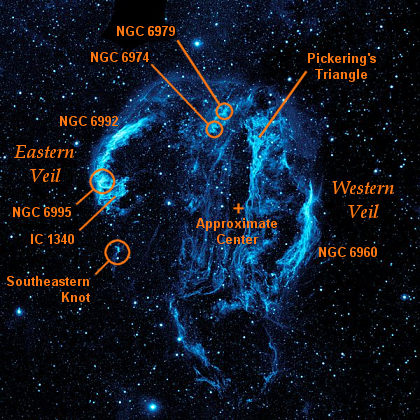 The Veil Nebula has several NGC designations because it is quite large. 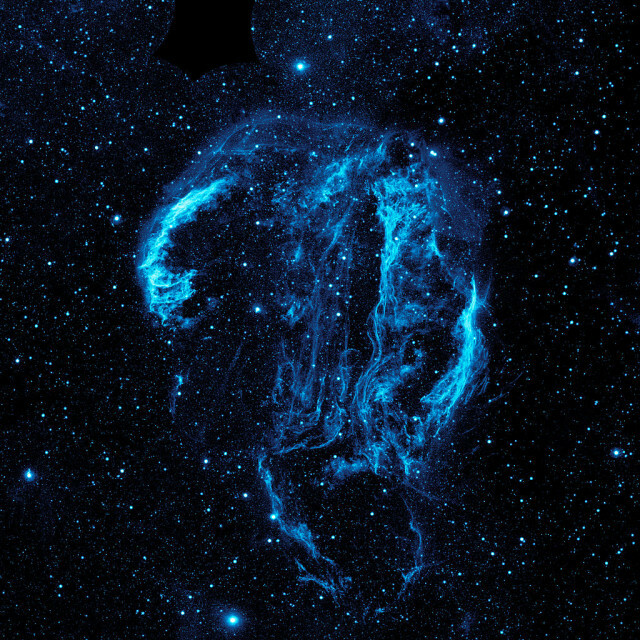 It consists of three main components: the Western Veil, the Eastern Veil, and Pickering’s Triangle. 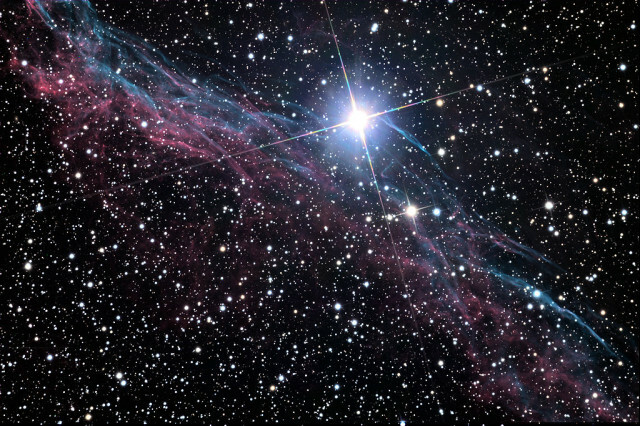 The names Veil Nebula, Filamentary Nebula, and Cirrus Nebula are generally used for the entire visible portion of the supernova remnant and sometimes even for the whole Cygnus Loop. 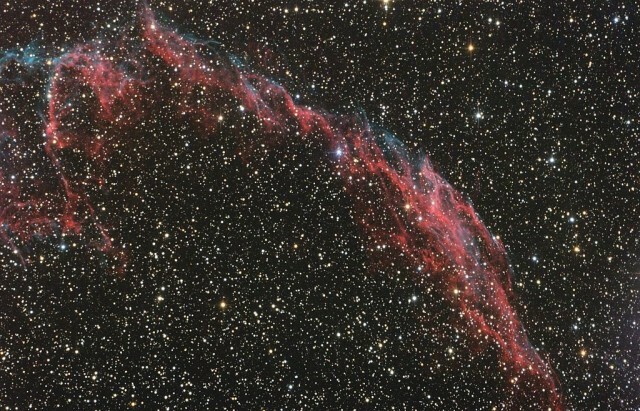 The Western Veil Nebula lies near the foreground star 52 Cygni. 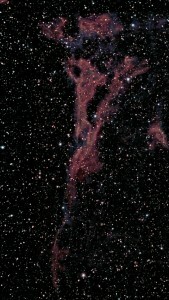 It is also known as Witch’s Broom Nebula, Filamentary Nebula, Finger of God Nebula, Lace-work Nebula, or Caldwell 34. It has the designation NGC 6960 in the New General Catalogue, which is sometimes used as an identifier for the entire nebula. The Witch’s Broom is the western-most object in the Veil Nebula. It spans a region of about 35 light years. 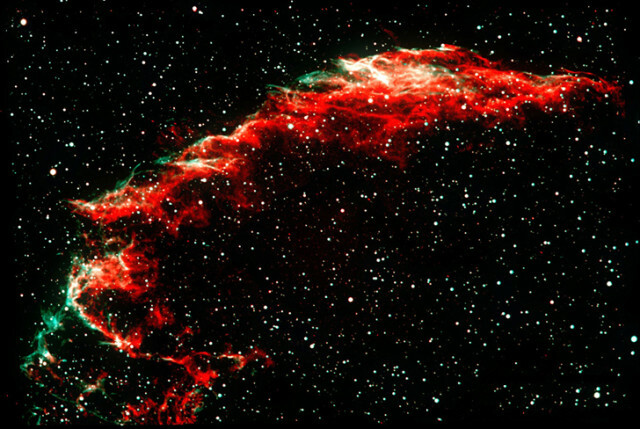 The Eastern Veil Nebula is also known as Caldwell 33. Its brightest region has the designation NGC 6992 and it stretches into NGC 6995 and IC 1340 to the south. NGC 6992, an HI shell, lies along the northeastern border of the Cygnus Loop. 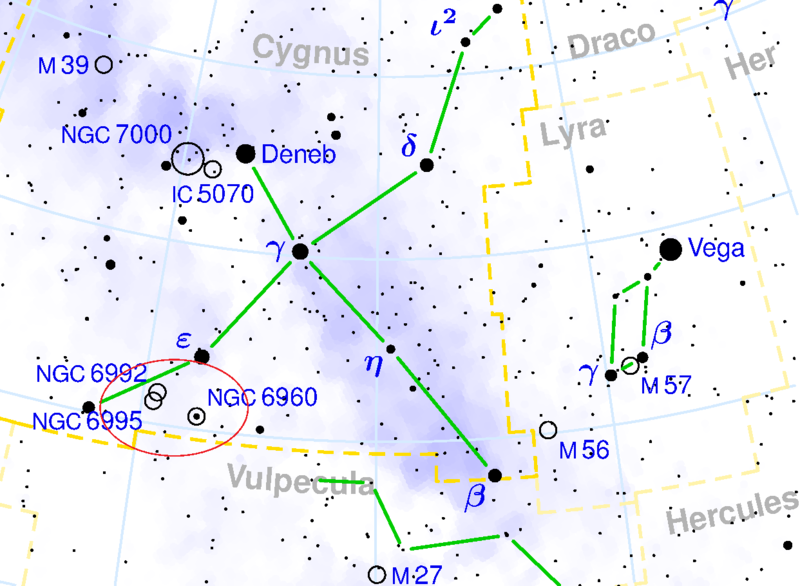 NGC 6995 can be found to the south of NGC 6992 and IC 1340 lies even farther south. NGC 6992 and NGC 6995 are sometimes known as the Network Nebula. John Herschel assigned the nebula two different numbers in 1825, while Truman Safford discovered and catalogued IC 1340 in 1866. Fleming’s Triangle, also known as Pickering’s Triangle, Pickering’s Triangular Wisp or Pickering’s Wedge, lies at the north central edge of the Cygnus Loop and stretches toward its central region. It is brightest along the northern side. It was originally named after Edward Charles Pickering, the director of the Harvard Observatory, where Williamina Fleming discovered the object. The luminous knots NGC 6974 and NGC 6979 lie in a fainter region of nebulosity on the northern edge between Fleming’s Triangle and the Eastern Veil (NGC 6992). NGC 6974 was discovered by Lord Rosse and NGC 6979 by William Herschel. The designation NGC 6979 is sometimes also used to refer to Fleming’s Triangle. 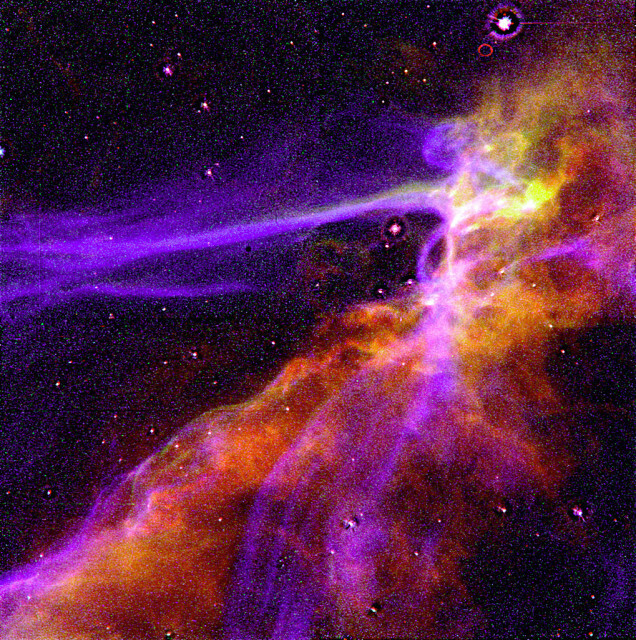 The southeastern knot of the Cygnus Loop was likely produced as a result of a collision of the supernova’s blast wave and a nearly small isolated cloud. The knot is an X-ray source. 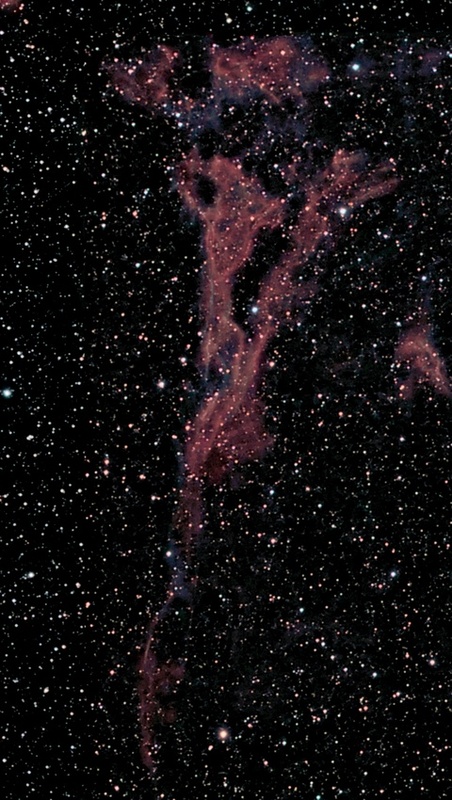 William Herschel discovered the Veil Nebula on September 5, 1784. Pickering’s Triangle, a fainter portion of the nebula, was discovered by Williamina Fleming in 1904. It wasn’t assigned a NGC number because it was discovered after the New General Catalogue was published. The distance to the Veil Nebula is uncertain, but current estimates based on the Far Ultraviolet Spectroscopic Explorer (FUSE) data support an approximate distance of 1,470 light years from Earth. Until recently, the distance was estimated at about 2,500 light years. In 1999, William Blair compared the angular expansion of the nebula along the size of the bubble with direct measurements of the nebula’s radial expansion in our direction. He discovered that the size of the bubble was roughly 40 percent smaller than previously believed, which led to an estimated distance of 1,470 light years. A more recent survey revealed that a star, designated KPD2055+311, that appeared in far-ultraviolet pictures of the nebula, was at a distance of 1,860 light years, which placed it behind the Cygnus Loop. The Cygnus Loop has a radio source designation W78 and is also known as Sharpless 103. 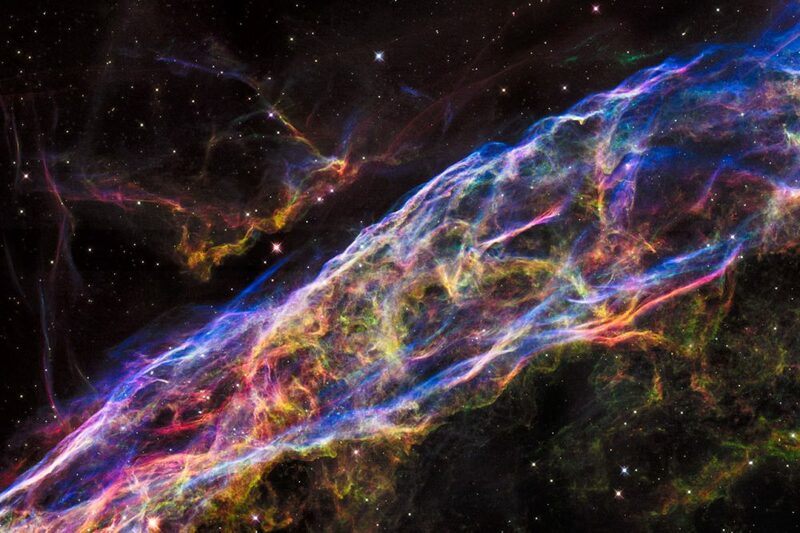 The Veil Nebula is one of the brightest, largest X-ray sources in the sky. The analysis of its emissions indicate that it contains oxygen, hydrogen, and sulphur.